To upgrade you need a Feature-on-Demand (FoD) key. Unfortunately, the documentation says how to install this using the web GUI or CLI. This is fine if you already have IMM2 Standard, but on an x3250M4 (for example), you cannot get the web GUI and hence cannot install the FoD key (but see below). Note down your model types and serial numbers. Visit http://www.ibm.com/systems/x/fod/ and use the Request activation key link to request your keys. You will need to do a separate request for each machine. You will be emailed a series of .zip files. Extract the .key file (named like ibm_fod_0004_2583KDAB123_anyos_noarch.key) from each of these and save into a central location. Files starting with ibm_fod_0004 are upgrades to IMM2 Standard. 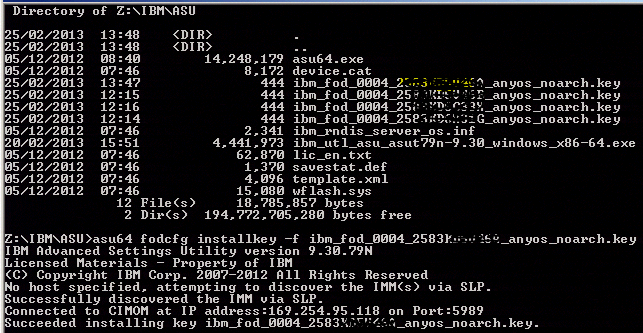 Files starting with ibm_fod_0001 are upgrades to IMM2 Advanced. Note that the machine type (2583) and serial number (KDAD123) are embedded in the file name. Do not mix the files up! With recent IMM2 firmware, you can upload the key file directly from the IMM web GUI even with IMM2 Basic. Therefore the recommended procedure is to update firmware before continuing. Once you have the key file(s), click on Add.., browse to the key file and upload it. You will then be presented with the standard IMM2 login screen and can login to add any further keys (see below). Log into the IMM. Click on IMM Management menu and then pick Activation Key Management. Click on Add.. then browse and upload the key file. It will take effect immediately. When installing this way, the updated IMM2 will be usable immediately through a web-browser. Insert the USB pen drive into the server. Reboot the server and follow the guide to get into the DSA. Once in the GUI, click on the Features on Demand (FoD) link on the left.